I read this article and found it very interesting, thought it might be something for you. The article is called THE BRIDE, HER FEMALE GUESTS & HER BOUQUET and is located at http://www.ipcevents.com.ng/female-guesther-bouquet/. I absolutely love weddings! oh, yes i do! it’s rejuvenates me… i love everything about weddings especially the part where the couples take their vows (i already wrote about vows *bats eyelash*) but besides that, i also love the part where the bride throws her bouquet of flowers to her set of single friends. IPC-Events makes it a point of duty to see that this part is perfectly organised and well enjoyed… we put in extra effort in getting the single ladies inside the hall together, we make them contend for the bouquet just like the picture below. Over the years, wedding dresses became more expensive and it became traditional for women to keep them, either as a memento or to pass on to a daughter for her wedding day. To prevent guests from ripping the wedding dress, brides began throwing other objects as a distraction, one of which was the garter (A circular piece of fabric or leather that was normally tied near the knee to keep socks or stockings from falling down). Later, the bouquet became the most traditionally thrown object. The wedding bouquet is particularly suited to this use, as flowers also symbolizes fertility. And because they are perishable items, the bride wouldn’t wish to keep them for too long. 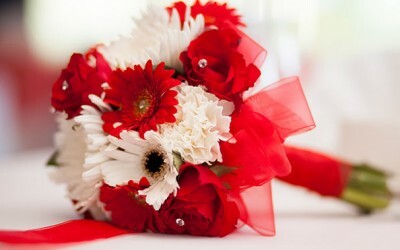 The bouquet is a better option because it is more fashionable and attractive. it gives colour and a sense of femininity to a wedding. it allows you play around with the theme of the event. it is also a safer item to toss than the garter. I remember an article i stumbled on while doing a research some time ago, it opines that in the olden days, Ladies used to go to wedding ceremonies with scissors in their hand bags which they intend using to tear off a portion of the wedding dress. There was a certain wedding where the bride hadn’t fully stepped out of the car when some single ladies pounced on her, some went for her dress,while others went for her garter! in her thigh ooo huhhhhh??? Can you just imagine that??? Hian’ Na so marriage hungry them rish? So, just imagine if the custom of tearing the bride’s dress was still in existence… we wouldn’t have this pretty bride up here in here super gorgeous dress (which she made herself) *winks* and i’m sure most brides will be wearing jeans trousers underneath their gowns! Lol! we hope this piece of information is quite relevant to you. please drop a comment, and yaaaaaaay the good news is, you can now “Like’ Our facebook fanpage from this Blog. find below the ‘Like botton’.